A video featuring Webster University students has been screening in Vienna's English-language cinemas this year to introduce movie-goers to the University's storied history and exciting future in the new Webster Vienna location at the Palais Wenkheim. 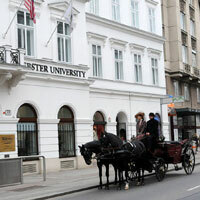 The ad runs at two English-language cinemas (Haydn Kino and Artis International) ahead of the Vienna campus' periodic open information sessions for prospective students. With seven screens in these theaters and multiple screenings a day, it has been seen by thousands of people this year in the city where Webster opened its second international campus in 1981. Several Webster students participated in the video shoot, which was conducted in January. The finished piece weaves together history from Webster's 1915 founding in the American Midwest with that of the Austrian city, which an annual Mercer study has named the "World's Most Livable City" for six consecutive years. The clip then nods to the institution's global plans as it enters its second century. See behind-the-scenes still shots from the video shoot at Webster Vienna's Facebook page here and here.